Tennessee Williams (age 54) photographed by Orland Fernandez in 1965 for the twentieth anniversary of The Glass Menagerie. 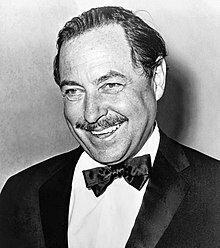 Thomas Lanier "Tennessee" Williams III (March 26, 1911 – February 25, 1983) was an American writer, perhaps best known for his play A Streetcar Named Desire. He was of English, Welsh and Huguenot ancestry. He was gay. He was an alcoholic and drug addict who died of an accidental drug overdose. This page was last changed on 22 November 2016, at 16:45.